Slot machine cheats is the task for the most sophisticated gamblers. However, in any case it is not as easy as it seems. Indeed, cheating at slots is equal to stealing money, because the slots are considered to be money game of chance. Anyway, some cheaters resort to scams in order to win at any cost. 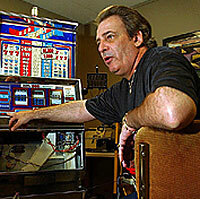 Slots cheater like Tommy Carmichael is considered to implement the best slot machine cheats in slots history. It is interesting to know that he invented the Monkey's paw trick. Ironically, he also builds anti-cheat devices these days. Let us consider some cheats in particular. The paw of the monkey is an effective device invented by Carmichael. It consists of a piece of flexible steel a foot in length bent like the claw on one of its ends. The device was designed for insertion into the chute of the payout to reach coin counter. By means of the device the machine would be interfered and overpay. It is one of the most effective cheating devices for slots. It is the focused light that is usually directed to the sensors of the slot machines. In such a way machine is confused concerning how many coins are paid for winning. However, it works not for a long. The casinos detect such scams. Fake coins are used to counterfeit the slots. People who use the counterfeit coins are called sluggers. Shaved coins are often used and also the coins on strings. Counterfeiting is the classic trick of cheating slots. With the usage of the coat hanger as in the case with the Monkey's paw, the machine is not able to cope with the repays accurately. It is considered to be one of the most ancient cheating methods. In the past a lot of cheaters managed to introduce the flaws in the slots machines even before they were delivered to the gambling establishments. Sure thing, the cheat requires nice preparation and having a man inside or a good programmer. If everything is done appropriately, the slot machine will conduct repays in certain time and in certain patterns after the button is pushed. However, it is almost impossible for almost each cheater, who had an attempt to do that, was caught. The latest casino slots are advanced and have anti-cheating security. Anyway, it is obvious that the most sophisticated secure will not stop the cheaters, never!